The reality is I'm a redhead with very light skin. I've had a few horrible burns in my lifetime; one when I was a kid and a couple in my early adult years. I've had a few light burns (is that such a thing? ), but it wasn't until fairly recently that I became passionate about sun safety. Oddly enough, it wasn't even a sunburn that truly turned around my outlook on sun safety. Rather, it's my baby girl. I always make it a point to slather sunscreen on her, put a hat on her head (which stays for mere seconds) and pop sunglasses on her face. I haven't always taken such good care of me, but in everything I do, I aim to be a model for her. If she doesn't see me protecting myself, she may not desire to protect herself in the future. Recently, I purchased a high SPF sunscreen and a chapstick with sunscreen to better protect myself. I also have sunglasses for my eyes. Vitamin D is super beneficial for more than just our skin; being in the sun lifts one's mood. You could say spending time in the sun allows for a sunny outlook on life. I'm not suggesting at all that we skip out on playing outside, swimming, picking berries and living life. But what I would recommend is slathering on high SPF sunscreen and protecting your skin from real damage that could be caused by the sun. I know the world says, "But tans are hot!" You know what's hotter? Less wrinkles when I'm older. Honestly, I don't even really care about wrinkles but to give people who care about appearances a reason for sun safety, here it is: anytime you lay in a tanning bed or lay out in the sun, you're adding more wrinkles to your face when you're older. Maybe appearances aren't all that important to you. They aren't to me. So for those of you who are like me, here's this: skin cancer is real and it's not pretty. It's not fun, and it's not healthy. By doing something so simple as putting on sunscreen, you could quite literally save your life. Here's the good news: sunscreen is pretty cheap! I bought a bottle of sunscreen for Jason and I to share and a chapstick with SPF from amazon.com (using gift cards I received from Swagbucks, of course) for about $13. My cost was $0 out of pocket since I did use gift cards. The sunscreen and the chapstick will definitely last until they expire, which is usually around 6 months to a year for these types of items. Check the expiration date on your items to see when exactly they expire. I'm a fan of SPF 50 - it's just the right middle ground. For chapsticks, it's unlikely you can find one with that much SPF, but anything with 15 and over will work great. 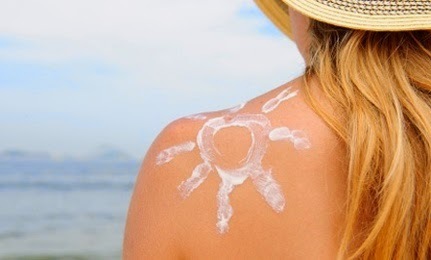 Be sure to apply sunscreen correctly - you need more lotion than you think. Read the bottle for full directions on the amount to use. Re-apply often. Typically, you should reapply every 80 minutes you're in water, directly after towel drying or every 2 hours if not in water. If you're going out for the day and will be outside, pack your sunscreen, chapstick, hats, sunglasses, and lots of water. If you have dark skin, you're not safe from the sun. It's true you won't burn as easily. Your skin has higher levels of melatonin so it may take longer for you to see the sun's effects on your skin. But be rest assured: spend enough time in direct sunlight and you can and will burn. Maybe you're careful, or maybe you weren't and now you've got a burn. In the early stages of a burn, dip a wash cloth in apple cider vinegar and lay it on your burned skin. That helps take away the pain. Once you're in the stage where peeling will begin soon, I slather coconut oil on my skin to help moisturize the burned skin. That doesn't necessarily help the peeling not occur. Peeling is your skin's way of healing, after all, but it's good to feel like you're doing something and it will help your skin stay moisturized. I personally feel the oil helps skin heal faster but that's not a scientific fact (or if it is, I don't know it is and do not want to make untrue claims here). I know sunscreen might not always seem glamorous, but the truth is is that the effects of not wearing sunscreen are not just ugly, they are life-threatening. I'd rather have life over a tan any day.